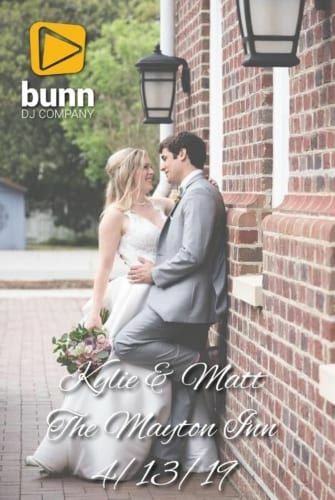 Kylie and Matthew had both ceremony and reception at The Mayton Inn in downtown Cary NC on April 13th and I was thrilled to supply music for both. The ceremony was held on the back patio under a tent just in case of rain. As the 100 guests arrived I had a mix of light classical music playing. The alter looked beautiful with floral arrangements by Tre Bella! When the ceremony was about to begin, guests took their seats and I found Reverend Barbara Lodge to attach her mic. The Parents and Groomsmen entered to “Jesu, Joy Of Man’s Desiring” and Bridesmaids to “Air On A G String”. Kylie and her Father came down the aisle to “Canon In D”. After a wonderful service by Barbara, they recessed to “Signed, Sealed, Delivered”. Barbara invited guests inside for the cocktail hour with help from planner extraordinaire Sally Oakley. During the cocktail hour inside I had a mix of beach music, classic soul and soft rock playing. After pics were taken by Jason from Veritas Digital Photography the guests found their seats and it was time for the wedding party introductions. I acknowledge the Grandmother and Parents, then introduced the wedding party to “We Are Family”. Kylie and Matt were introduced to “You Make My Dreams Come True”. They came in to loud applause and took their seats at the head table. The food stations opened shortly and I went right back to music during dinner. After dinner we had the toasts and Once In A Blue Moon cake cutting to “This Will Be (An Everlasting Love)”. The cake was delicious!! Then, we all sang Happy Birthday to Kylie’s 92 year old Grandmother!! After the cake cutting and after Kylie cleaned all the cake off her face (thanks to Matt.. LOL), they had their first dance to “This Magic Moment”. The Parents dances followed to “Stand By Me” and “How Sweet It is”. I opened the floor to everyone with some Beach music and Top 40 that had young and old dancing for the next couple hours. We ended the night with a last dance to “Save The Last Dance For Me” and a sparkler exit. Thank you so much Kylie, Matt and Sally!! I had the best time!!! 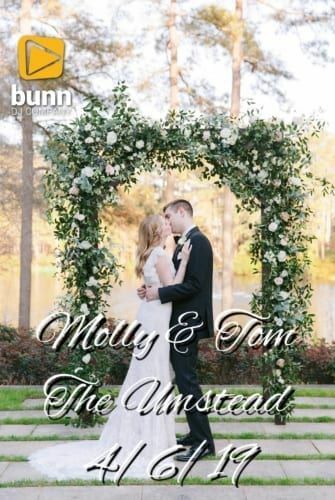 I will never get to DJ Taylor Swift’s wedding (probably not), but I came very close with Molly and Tom’s wedding at The Umstead Hotel on April 6th. Their ceremony was held out back of The Umstead overlooking a pond with beautiful floral arrangements by Wylde Flowers. 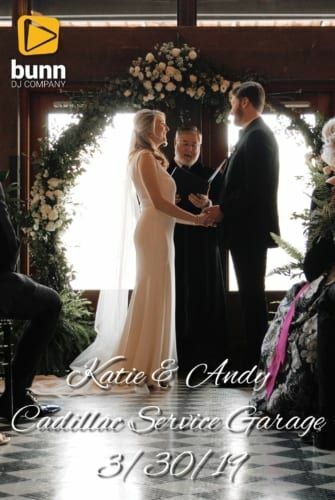 Their ceremony music was performed by the phenomenal Arioso Strings. After the service planner Megan from A Southern Soiree (with help from Aneesa from Harmony Weddings) invited the 150 guests upstairs for the cocktail hour and reception. During the cocktail hour I had a mix of classical covers of pop songs playing. After the cocktail hour the doors to the ballroom opened and I left some pop music playing while I went to touch base with Molly and Tom for introductions. I introduced just them to “You Make My Dreams Come True” and they came in to loud cheers. They had their first dance to The National’s “Dark Side Of The Gym”. They were singing it to each other like they were in their kitchen alone. So sweet!! After their dance her Father welcomed everyone and Pastor Kevin blessed the meal. The food stations opened and I had a mix of jazz standards playing. After dinner we had the toasts and Ashley’s Cake cutting to “You Are The Best Thing”. I had the strawberry cake!! J. While the staff cut the cake and served it we had the parents dances. Molly and her Father danced to “You’ve Got A Friend” by Carole King. LOVE that version! Tom and his Mother had their dance to “Return To Pooh Corner”. Such a great song. I opened the floor to everyone with some Motown and 70’s that shortly filled it for the rest of the night. During the dancing I played lots of 70’s and 80’s, Of course lots of Taylor Swift, some current top 40 and even a J-Pop song for Tom’s friends. We ended the night with “Run Away With Me” by Carly Rae Jepsen before a confetti exit. I’ve seen some of the sneak peek pics by Photographer Mina Von Feilitzsch and can’t wait to see more!! Thank you Molly, Tom, Megan, Aneesa and Kaila! I had the best time!! Oh, and a big Happy Birthday to Tom who’s birthday was the day before. 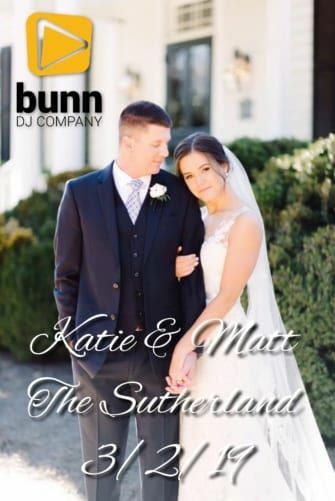 Katie has heard me DJ weddings a couple dozen or more times as a videographer with Twenty One Films and always dreamed of having me as her Wedding DJ. I was honored (and humbled) to make her dream come true on March 30thwhen she married Andy at Greensboro’s Cadillac Service Garage. Their ceremony was held in the front room of the building and I provided music and mics from the balcony. As the 120 guests arrived I had a mix of acoustic indie rock playing. The Grandparents through the wedding party entered to “Beyond” by Leon Bridges. I LOVE Leon Bridges!!! Katie and her Father entered to “Heartbeats” by Jose Gonzales from the TV show One Tree Hill. After a short service with 2 readings, they recessed to “I Believe In A Thing Called Love” by The Darkness. Their minister invited everyone upstairs for the cocktail hour and I started the cocktail music. During the cocktail hour I had a mix of soft rock, indie rock and classic soul playing. Photographer Samantha Floyd and Videographers Twenty One Films got some shots inside and outside of the wedding party before letting them join the cocktail hour. After the cocktail hour I invited guests downstairs to the reception area in the back and went to line the wedding party up for introductions with help from planner Kaitlyn from Exceptional Events. I introduced the Parents to “This Will Be (An Everlasting Love)” and wedding party to “Party Up” by DMX. LOL!! Katie and Andy entered to “I Want Candy” and had their first dance to “I Love You Always Forever” by Donna Lewis. I have always loved that song! Her Father gave a heartfelt welcome and Andy’s Mother blessed the meal. During dinner I had the same mix as cocktails playing. After dinner we had the toasts and then the Parents dances. We started with Andy and his Mother’s dance to “Forever Young” and then it was time for Katie and her Father’s epic dance to a medley he made of “Only You” Yaz, “Shake it off” Taylor Swift and “Footloose” that was awesome! He used to sing ”Only You” to her when she was young. I love that whole Yaz album!!!! We had the cake cutting next to “Cut The Cake” by Average White Band and then opened the floor with some 80’s. The floor instantly packed with young and old for the next couple hours. My favorite moments of the dancing were Katie’s families dance to “Born To Be Alive”, their circle dance to “Lazy Mary” by Lou Monte and the couple of polkas. So great!! We paused for a bouquet toss to “Single Ladies” and then back to dancing to some hip hop and top 40 that included 3 Kendrick Lamar songs for Andy. We ended the night with “Sweet Caroline” before a streamers exit. Thank you so so much Katie, Andy, Mr & Mrs Bially, Jess & Phil and Kaitlyn! I loved every minute of it and was so honored!! I was so excited to DJ Emma and Phil’s wedding at Haw River Ballroom in Saxapahaw NC on March 23rd! I have seen a few concerts in the building, but never dreamed I would share the stage for a wedding. The ceremony was held earlier in the day at a Church, then the 200 guests headed over to the Haw River Ballroom for the reception. As the guests arrived I had a mix of rock, classic soul and country playing. When the bridal party arrived, I left music playing and went to line them up with help from planner Britni from A Touch Of Southern Events. I introduced the wedding party to “Celebration” and they lined up in front of the stage. Emma and Phil came in to loud applause and had their first dance to the piano version of “Then” by Brad Paisley. Her Father welcomed everyone and Dr Shive blessed the meal. The salads and entrees came out and they had a live jazz band, Mahalo Jazz, provide music during dinner. They did an amazing job and are the house band from the restaurant next door, The Eddy Pub. I could have listened to them all night. After dinner we had the Edible Art cake cutting to “Amazed” followed by the parents dances and toasts. Emma & her Father danced to “My Little Girl” and Phil & his Mother to “My Wish”. Emma’s Father took the mic to start the toasts, then the Best Man and Maid Of Honor finished them. We had an anniversary dance to “A Thousand Years” and opened the floor to everyone with some Beach music, Motown and top 40 that filled it for the next 2 hours. I even played Gucci Mane for Phil!! We paused for the bouquet and garter toss, then back to dancing. We ended the night with “Closing Time” before a sparkler exit. After the last dance photographer Steve Exum had a surprise for everyone. He had a slide show already done from the ceremony and showed it on the screen before leaving. It was so great and really was a nice finish to an awesome wedding reception. I can’t wait to see his photos from the reception and video by Bowtie Films. Thank you Emma, Phil, Mr & Mrs Holt and Britni! I had the best time!! 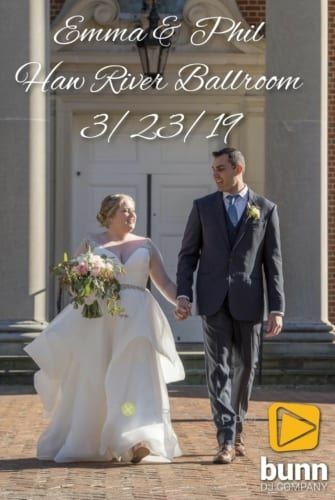 I was back to The Pavilion and Carriage Farm, this time for Chad and Summer’s beautiful ceremony and reception on another picture perfect March 16thday. The ceremony was held outside and I ran mics and music. As the 140 guests arrived I had a mix of classical pop songs playing. The Grandparents and Parents entered to “Wonderful Tonight” and wedding party to “Yellow”, both by Vitamin String Quarter. Summer entered to “Can’t Help Falling In Love” by The Piano Guys. The ceremony included two performances that were both amazing! One performance by Monica during the unity candle and another by Kelsey during the blessing of the hands really made is very special! After the ceremony they recessed to “This Will be (An Everlasting Love)” and made their way to the adjoining outdoor patio for the cocktail hour. During the cocktail hour I had a mix of standards and country playing with a little soft rock and Motown added. Summer, Chad and the wedding party were off getting pics taken by photographer Mark Mosrie. After pics were taken, planner Alyson invited guests to their tables inside. The room and fireplace looked beautiful with floral arrangements by Expressions Of Love. I introduced the Parents to ”I Gotta Feeling”, wedding party to “High Hopes” and Summer & Chad to “Bring Em Out”. They came right to the dance floor and had their first dance to “The Day Before You” by Rascal Flatts. After that, Summer’s Brother welcomed everyone and Stephanie Moore blessed the meal. The Catering Works buffet opened and I went back to music during dinner. I played a mix of country and standards again as well as “The Greatest Love Of All” by Whitney Houston in honor of Summer’s late Father, Al. After dinner we had the toasts and Parent’s dances. 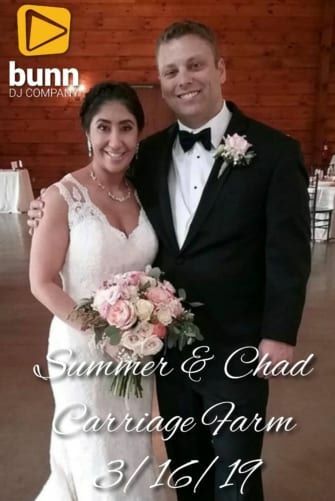 Summer danced with her new Father in Law to “What A Wonderful World” and Chad and his Mother to “My Wish”. We had an anniversary dance to “Through The Years” by Kenny Rogers that had the winners at 59 years married. I opened the floor to everyone with some Motown and Top 40 that soon filled it with young and old. We paused for the cake cutting to “You Make My Dreams Come True” and then a couple Lebanese dance songs to honor Summer’s roots while the staff served the cake. It was so great to see everyone dancing to those songs together hand in hand! Some 90’s Hip Hop rounded out the night before the last dance to “Then (Piano version)” by Brad Paisley and a sparkler exit. Thank you Summer, Chad and Alyson! I had the best time!! Picture prefect can’t describe the wedding of Katie and Matt at The Sutherland in Wake Forest, NC on March 2nd. After a week of off and on rain, the weather turned perfect for them! Their ceremony was held on the brick walled lawn. I provided music and a mic for officiant Katherine Edwards. The Grandparents and Parents entered to “Canon In D” and wedding party to “A Thousand Years” by The Piano Guys. Katie and her Father entered to “Beethoven’s 5thSecret” also by The Piano Guys. After a short service, they recessed to “You’re My best Friend” by Queen and Katherine invited the 80 guests to the other side of the house for cocktails on the grooms terrace. During the cocktail hour I had a mix of rock, classic soul and country playing while guests enjoyed drinks by POUR and passed hors d’oeuvres by Rocky Top Catering. Towards the end of the cocktail hour, guests started coming into the pavilion where I was and finding their seats. The room looked beautiful with floral arrangements by Lyn from Fresh Affairs! I left some music playing and went to line the wedding party up for intros with help from The Sutherland’s Christy. I introduced the wedding party to “Now That We Found Love” by Heavy D and Matt and Katie to “Can’t Stop The Feeling”. They had their first dance to “Millionaire” followed by the parents dances. Katie and her Father danced to “I’ll Be There” by Josh Turner and Matt & his Mother to “Five Minutes More” by Scotty McCreery. Katie’s Father welcomed everyone and the salads came out before the buffet opened. During dinner was same music mix as cocktails. After dinner we had the Ashley Cakes cutting to “How Sweet It Is” and then the toasts. Before opening the floor to everyone we had an anniversary dance to “Something That We Do” by Clint Black with the winners at 61 years married!! Wow!! I opened the floor to everyone with “Build Me Up Buttercup” that filled the floor! It was amazing to only have 5 ppl left sitting during the first dance song for everyone. For the next 3 hours they danced to oldies, beach, top 40, some 80’s and 2000’s throwbacks and some 90’s hip-hop. We paused for the bouquet toss to “Where Dem Girls At” and garter toss to “You Look Good”. We ended the night with “Dancing In The Moonlight” before a private last dance for just Katie and Matt to “Dance With Me” by Morgan Evans and Kelsea Ballerini. The guests filled bags of candy for a late night treat and lined up for a sparkler exit. I can’t wait to see more pics from photographer Kelsey Nelson and videographers Twenty-One Films!! Thank you Katie, Matt and Christy! I had the best time!! 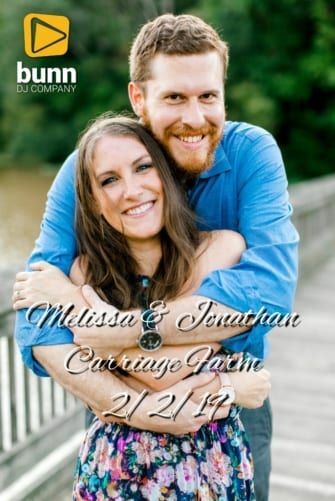 Melissa and Jonathan wanted a lo-key romantic wedding at The Pavilion at Carriage Farm in Raleigh and I was thrilled to help make it happen on February 2nd. Melissa had her heart set on an outdoor ceremony and Mother Nature helped her out perfectly!! The first 70 degree February day came just in time, 2 days after it was freezing. As the 80 guests arrived I had some light classical music playing. The site looked beautiful with floral arrangements by Daniel’s Florist. The Grandparents and Parents entered to “Ode To Joy”, Wedding party to a classical cover of “Perfect” and Melissa & her Father to “Canon In D”. After a short service by Pastor Eddie that included a unity candle prayer, they recessed to a classical cover of “All Of Me” followed by “Waterfall”. Pastor Eddie invited everyone to the outdoor patio for a social hour. I had a mix of rock, classic soul and country playing. When it was time for introductions, planner Stephanie Shaul nvited everyone inside for the reception. I introduced the wedding party to “Footloose” and Melissa and Jonathan to “Best Day Of My Life”. They had their first dance to “Die A Happy Man” followed by the parents dances. 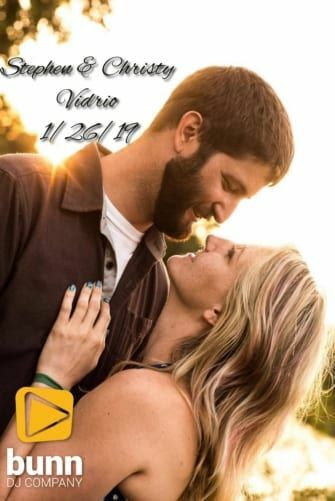 Melissa and her Father danced to “Forever Young” by Rod Stewart and Jonathan and his Mother to “Simple Man” by Shinedown. Her Father welcomed everyone and Pastor Eddie blessed the meal. After dinner we had an anniversary dance to “Still The One” by Orleans (LOVE that song!!). The s’mores station opened outside at the bonfire and I opened the floor to everyone with some beach music, top 40 and 80’s. I even played a good early 2000’s set for the wedding party to dance and sing a long to. I’m sure photographer Megan Kerns and videographers Muddy Trails got some great shots of them!! We paused for the Simply Cakescutting to “You’re My Best friend” then back to dancing until the end of the night. We ended the night with a last dance to ”Perfect” by Ed Sheeran and a sparkler exit. Thank you Melissa, Jonathan and Stephanie! That was a beautiful wedding!! 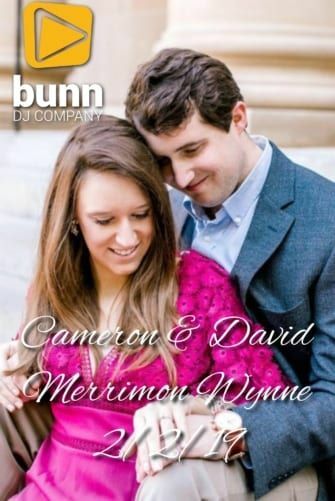 Cameron and David chose Merrimon Wynne’s Carriage House for their ceremony and for their reception. We did the music and mics for the ceremony, which went great, and when the guests went inside the older house for cocktails, we flipped the room for the reception. When the guests came back out, it was a totally different look! We started the evening with bridal party introductions to Natalie Cole’s “This Will Be An Everlasting Love”, an oldie but goodie. Next, they went right into their first dance, another one of my all time faves, “Let’s Stay Together” by Al Green. Cameron’s dad welcomed everyone next and then her uncle gave a great blessing. did an amazing job keeping everything running on time! One of the coolest venues in downtown Raleigh is Vidrio, where Christy and Stephen chose to have their wedding reception on January 26th. The reception was held on the whole 2ndfloor of the restaurant. As the 75 guests arrived I had a mix of 80’s, rock and classic soul playing in the bar area where I was set up. Guests enjoyed cocktails, passed hors d’oeuvres and the music. After visiting with everyone for a while, Christy and Stephen had their first dance to “Mario Kart Love Song” by Sam Hart. After that Stephen danced with his Mother to “Days Like This” by Van Morrison. LOVE that song!!! I invited everyone to the banquet room at the end of the floor for dinner and desserts. During the buffet dinner I had the same mix of music as cocktails. After dinner I invited everyone back out to the bar area for some dancing. Before opening the floor to everyone Christy dances with her Brother to “Stand By Me”. I opened the floor to everyone with ”Build Me Up Buttercup” that filled it pretty well with people dancing and singing it. Some 90’s and early 2000’s mixed with some 80’s kept them dancing for the rest of the night. I even played “Ain’t No Mountain High Enough” for Christy and her Sister to dance to that was one of the biggest songs of the night. Thank you Christy and Stephen! I had a blast playing for you and I loved your Gryffindor tie Stephen (I wore Hogwarts cufflinks that night)!! Alex and Randall had their wedding at the historic Merrimon-Wynne House near downtown Raleigh in late January on a Sunday. The day started around 5:30pm with bridal party introductions to Timberlake’s classic “Suit and Tie”. When Alex and Randall entered, they went right into their first dance “You Are The Best Thing” by Ray Lamontagne. Next, Alex and her dad danced to “My Wish” by Rascal Flatts and Randall and his mom danced to “Days Like This” by Van Morrison. The blessing was said and the buffet opened for the guests. After dinner, the cake was cut to James Taylor’s “How Sweet It Is” and then it was just open dance party time. There were no toasts, bouquet or garter, just a solid party! Their playlist had a little bit of everything and I was ripping through them all over 2.5 hours before the end and the big sparkler departure. What a wedding!